Back cover blurb: 1995. Savannah, Georgia, where the sunsets are long and golden and the air is hot and heavy with promise. Student Jim Johnson isn't happy when he has to abandon his plans of a carefree month of inter-railing to spend the summer in the Deep South with his mother and his father, a down-on-his luck author who has been sent to Savannah to rediscover his muse. But when Jim meets the beguiling Jennifer Wyatt, the daughter of the owners of Casa D'Or, the mysterious plantation house on the shores of a lake, Jim knows he has made the right decision in coming along. Until an event happens that shatters Jim and Jennifer's lives for ever and sets both their lives on a different course. 2015. Twenty Years later Casa D'Or stands abandoned and neglected, a victim of tragic events that everyone wants to keep buried. But when Jim Johnson's boss buys it as the latest acquisition to his hotel chain, Jim is forced to return to the house and restore it to its former glory. Fate throws him back into the orbit of Jennifer Wyatt, the woman his heart has never truly got over, but as he tries to put the ghosts of the past behind him, he unearths a chilling secret that makes him wonder what he has ever really known about the people he loves. Jim Johnson is a hotshot property developer for Omari hotels, he is approaching Forty with a beautiful girlfriend, and the promise of the ultimate job, CEO of Omari. But the job comes at a price, Jim's boss Simon Desai wants Casa D'or to be the ultimate luxury hotel addition to the Omari portfolio. Casa D'or is a former plantation in Savannah, Georgia. Jim is familiar with the area and the luxurious house having been forced to spend a summer there when he was younger. He found and lost his first true love, Jennifer Wyatt there, and isn't sure that he'll be welcomed back to the area with open arms. But his job depends on it. There are many things that I loved about the House on Sunset Lake, the setting, the beautiful storyline and it's wonderful (and some not so wonderful characters. 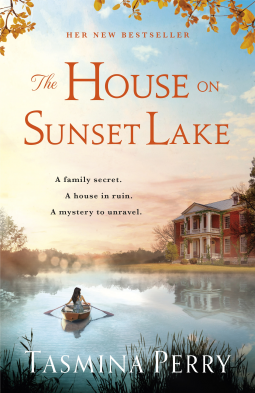 The House on Sunset Lake is a beautifully written novel that will leave you wanting a sequel to find out what just the future might hold for Jim Johnson and his family and friends. The House on Sunset Lake is available now via Amazon online and all good book shops.